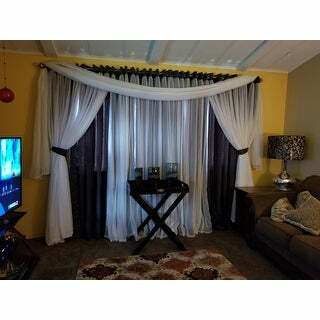 These curtains are such great quality and so elegant. I will purchase more to put in all rooms. These woven panels drape beautifully and, they are cleverly interwoven with blackout insulation. 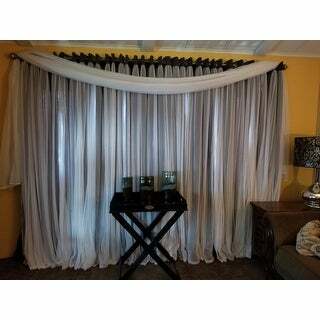 A sateen woven blackout curtain, paired with the fashionable elegance of a sewn-in, sheer white panel for layered sophistication, this set provides a touch of sophistication to your decor. 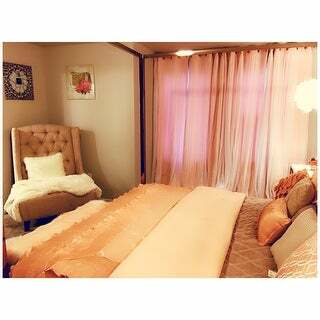 These curtains are everything!! 120 inches was very long, but once hung the way that the pool on the ground make my very small apartment living room look so much larger. They are so very versatile - the black out is complete (I do have blinds behind them. But even without the blinds closed and regular sun coming through these really do block it out. 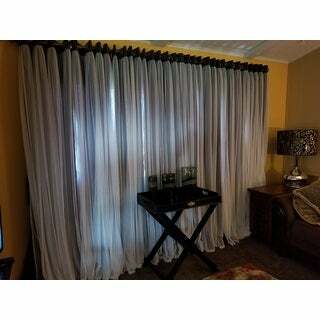 The sheer overlay makes these curtains look so luxurious. The possibilities of styling them has been so much fun. I ordered two panels to mount on a 120 inch curtain rod - I will be needing two more panels. I will post photos once I get the other panels up! The white color looks so beautiful - in the ad they appear to be maybe "too white" but they are crisp and clean and just fabulous. These curtains are truly beautiful. They are super thick and the sheer is one of the nicest I’ve ever felt! They also arrived very quickly, ordered on a Saturday and they were here by Wednesday. Highly HIGHLY recommend, you won’t be disappointed! 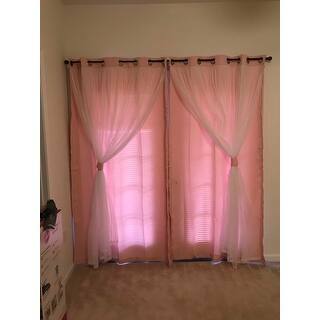 I was looking for a long time for the perfect pink drapes for my daughter's room. These drapes fit the need perfectly. The pink and sheer white panels are a perfect balance. They bring elegance and refinement to the whole room. They are not completely room darkening blinds, but however block a lot of light. The fabric is very good and the drapes are well made. Highly recommend. LOVE these! These curtains are a true white color and I say that because most of the time, “white” really doesn’t mean white and you end up with an ivory or cream color which makes me batty. The quality - better than what I expected. They just look classy and absolutely stunning. There are 2 panels and I was able to cover the space I needed which was about 64 inches wide. So happy with my curtains! The curtains are nice, and I like the overlay. However, they aren’t entirely blackout, more like room-darkening. The blinds were open behind them here, but you can see a fair amount of light is still going to come through. Also, to note, I thought with the ties there would be buttons on the curtains or something, or snaps on the ties themselves. However, the ties only have loops on either end, and I guess you have to fashion a knot out of them. Both ties came with my curtains, but one of the loops broke the second time I tried to use it (one end came out of the fabric). Final note, some of the metal “rings” that slide along the curtain rod were slightly rusted when I opened up my curtains. But they look nice, and they darken the room, which is what I wanted them to do. These curtains are amazing in person. 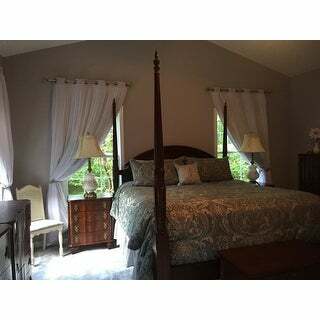 I wanted curtains for privacy at night and still allow a bit of light through them during the day. I got the white ones and they are definitely not full 100% blackout, but they filter out light pretty well. They are light and airy, but made of quality durability. One panel had a tiny stain at the top, but I got it out by spot treating it. These are white not an off white or cream or weird gray white.... true WHITE WHITE. I get a ton of compliments on them and even my husband loves them! I will update later today with pictures to help for reference. Get these - you won't regret it. I was searching for white "blackout" curtains to match my white-furniture office, but I am glad that I chose these in "sand" color (beige) instead. Due to the white gauze overlay, it matches the white furniture in my study. Also, I have gold accessories in the study that coordinate well with the base color of the curtains. I ordered two sets which equals 4 panels for the 70" wide window. They are pricey but they look amazing--flowy and soft--which enhances the theme of the room. Also, having two sets helps with the room darkening effect--which is hard to achieve with light colored curtains. These are beautiful. One panel can cover one window - the sheer overlay makes them look full. I Like how you can adjust to blackout panel or sheers. I ordered the 96 “ length. 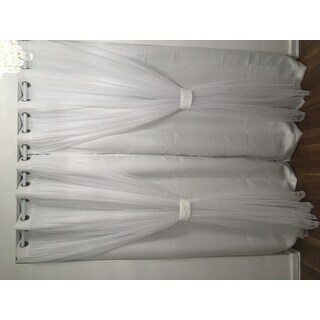 This is very good quality curtain and also very pretty. I love it. The color is true to the picture. Unfortunately my window frame is too small for this, therefore I had to return it. No matter what, I love this product. I highly recommend it. These were EXACTLY what I wanted!! I ordered the light grey 96" curtains.. they seemed a little taupe-ish at the top by the grommets, but the backing was silver/grey.. I wanted something on the light grey side with the white overlay so it wasn't Stark White. The dual layer helps it look full but not heavy, very flowy and dreamy. 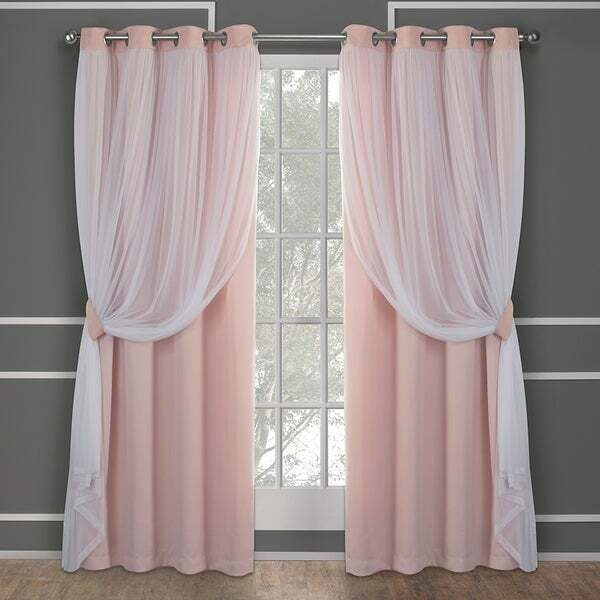 I am using them for my daughter's nursery and wanted them floor to ceiling to add height and make the windows appear bigger.. this did the job perfectly, I might hem them up 1-2 inches so they barely graze the floor and don't bunch. Better than expected! I absolutely love, love them. Definately would buy them again..They came on hangers. They added depth and romance to my living room. I added a white sheer silk scarf to the top, but even without that they are lovely. Beautiful! These curtains look amazing. I'm redoing my master with a romantic decor and these will fit in perfectly. I can't wait to receive them and see how well they look on my windows. Will update after I get them up. Hopefully I can post a picture. 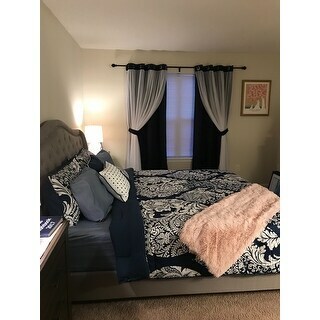 I purchased this curtain for our guest room . The color that I ordered is cloud grey but the one we received was sand. It didn’t work for our room so I had to return it. Customer service act fast and it was good. If the color was correct, that would be better. I recieved my curtains and there were just as described. I really love them, the material quality. I love these curtains!!! They are beautiful hanging up, pictures don’t do justice!!! Love these curtains. Privacy counts even in the country and these work great. They don't completely block out the sunlight, yet give my bedroom a soft glow. Absolutely beautiful. Heavier than i thought they wouls be but in a good way. LOVE the curtains, but one panel has a 1/4" black line going thru it. We were redoing our grand daughters bedroom so needed to put up before her birthday to make complete....Nice Heavy material!!!! Beautifully made and it’s true to color. They look wonderful in my living room and help my shabby chic decor look. The only downside is that I ordered the wrong size. But they’re worth keeping! Very elegant looking...perfect for my bedroom and the darkening is a plus. Just a little rip and stitches. "Can you see through these from outside at night?" You cannot see through. They are beautiful! No, you cannot see through. Love them! "Are they sold as a set or one panel ?" "Is the blush color a true blush or orange ?" It is exactly as pictured, a pink blush. "Are these curtains fitted for a 1inch or 3inch curtain rod?" The grommets have a diameter that allows up to a 1.5 inch rod. "Will you be getting back in stock winter white in 84 length? " "How wide is each panel? Is 52" per panel, or per pair?" "Is the 52 inch per panel or that each panel is 26 inch and the total is 52 inch?"